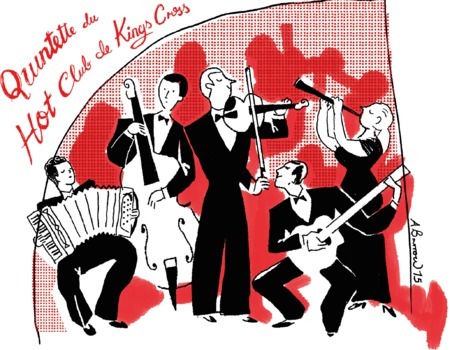 Formed long ago in the mists of 1999, The Kings Cross Hot Club has evolved into a curious collective comprising some of the most indefatigable musicians in London. Their oeuvre is a veritable cacophony of Manouche swing, Parisian musette, criminally forgotten pre-war melodies, Colombian Cumbia, Fellini soundtracks and even some original pieces. Whether you are smitten, amazed or downright disgusted, you will most definitely NOT be bored. Alice Mary is a vocalist and virtuosic clarinettist who has been lead singer for the Hot Club since the start of 2015, and their clarinettist since 2012, performing with them across and around London at a range of weird, wonderful and high end venues and events - including Twinwood Festival, Brunswick House, Kensington Palace, Kettners, Mondrian Hotel, Hyde Park, Mall Galleries, Cockpit Theatre, Secret Garden Party, 30 St Mary Axe and Foundling Museum. Their album 'Alice in the Jungle' is due for release early in 2016.